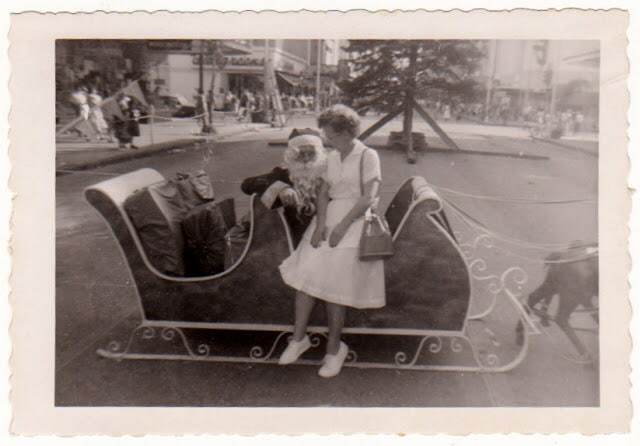 While looking in a big box of photos for my Mom’s 1950’s Christmas tree picture, I ran across this photo. I have no idea who this person is, but I found the photo amusing. I wonder if she knew Santa – they look a little cozy there. And look, there’s a Walgreens in the background! I have a lot of my Mom’s photos, both from her generation and my Grandmother’s generation. But sadly, there are quite a few of the photos that show people that I have no idea who they are. While your parents are still alive and of sound mind you should sit down with them and go through old photos and write down who is in the photos. It may save your Great-Aunt Martha’s photo from ending up in an antique store some day (which BTW makes me cringe when I see old photos for sale there). Or ending up on the internet with someone insinuating that she’s getting frisky with Santa. Hi,Pam. This is great advice. Don’t you just want to cry when you find photo albums at estate or garage sales with photos inside? I found some handwritten recipes this year in a cookbook this year at a sale and it just broke my heart. Inspired me to turn it into art. This is a fun photo though. I’m glad you shared! This is an adorable old snapshot! My husband and I are avid old photo rescuers! My husband goes to great efforts to reunite old photos that we’ve found with current ancestors that are still living! We get so excited when we find an old picture that has names on it because it obviously makes it easier to do the research. He has quite a few wonderful success stories! I absolutely love looking through old photos to see the fashion, the automobiles, the memories that were being created. It is sad that they sometimes get lost along the way… but it takes people like us to rescue them! This is so true. My mom is 83 and her sister is 85. They both have dementia and severe short term memory loss. We had to put them both in a nursing home but they share a room together. I have gone through all her old pictures and I take the ones with nothing on them up there and they enjoy going through them. Some they remember but some they don’t. Wish I would have done it when my mom was younger. I couldn’t agree with you more about identifying people in old photos. I have become the family “historian” and have spent hours scanning old photos and documenting who is in the photo. It’s definitely a labor of love!! A very important reminder! We have a lot of my husband’s grandmother’s photos and very few are labeled. I am always sad to see photos at the antique stores and have even *adopted* a few, lol. That is awesome Pam(that you found that), and how cool is that picture??? I tried to get my Mother to go through old photos and she was overwelmed. I took the pictures that I like and knew who the people were. She now has inherited her brothers old photos and doesn’t know who the people are. So good advice. It make me sad as well to see old photos abandoned. I completely agree I dispair over seeing the photos and one other thing, old charm bracelets. The bracelets with those personalized charms just break my heart. that is a fabulous old picture! I love old pictures and collect them. Especially holiday ones. My grandmother used to write on EVERYTHING. dates, names, her thoughts, she kept a journal all her life. We always made fun of her when we were younger. Now we are so glad she did it. I could spend hours going through old photos and old papers.